It is true to say that the table laid out for a banquet in medieval times must have been something spectacular to behold. Sitting at such a table was of course the privilege of the rich and noble families; the poor common man never saw one. They only knew about it through hearsay or via a relative or friend who perhaps worked in a castle kitchen. Most medieval castles had a special hall – a ‘Great Hall’ as they were more commonly known. These were used to stage often incredible banquets and the banqueting table itself was the focus of the celebration. Usually of a substantial length, the table had to cater for the enormous number and variety of dishes that were usually served, course after course after course. 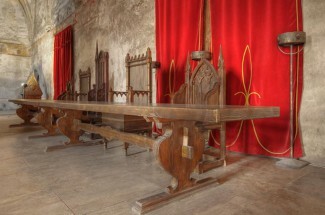 As a general rule, the main table was raised higher than the others indicating that it was reserved for people of very high rank or a member of a royal family. This table would be perpendicular to the others in the hall and would have been decorated and covered with a fine cloth (often damask) with a sanap or overlay on top of it for protection as it was such delicate material. 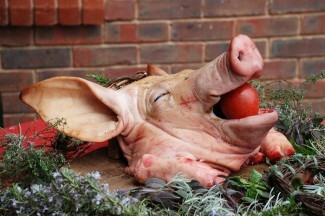 The centrepiece of the main table usually had a very theatrical presentation. It might have been an ornately gilded pheasant or swan raised up high on a special wooden plinth. Other areas of it would have been specially decorated such as with a pig or boar’s head perhaps which would have been stuffed and quite likely eaten later. On the adjacent tables people were usually seated in descending order of social rank. They would be sat on benches or stools at less ornate, long tables parallel to the side walls of the Great Hall. These were known as sideboards. Interesting that the word is still used today in England to mean tables or cupboards placed against side walls, though of course there’s no banqueting connotation. We can get an idea of what a medieval feasting table looked like from the photo (top) which shows the banquet table at Corvinesti Castle in Romania. Imagine though just how wonderful it would have been if photography had been around in the 12th-15th century – then we could all see for ourselves what it was really like.